Jameson 18 Year Old Limited Reserve (~€130) is a well balanced blended whiskey and is the high end product of the Jameson range. Its mellow, complex taste and lingering finale of wood, spice and toffee have been created by the Master Blender by hand-picking no fewer than three exquisitely poised whiskeys serving as the light, shade and foreground used to craft this unique blend. Matured for at least 18 years in a combination of bourbon and sherry casks, it's given a final finish in fresh fill American bourbon barrels. 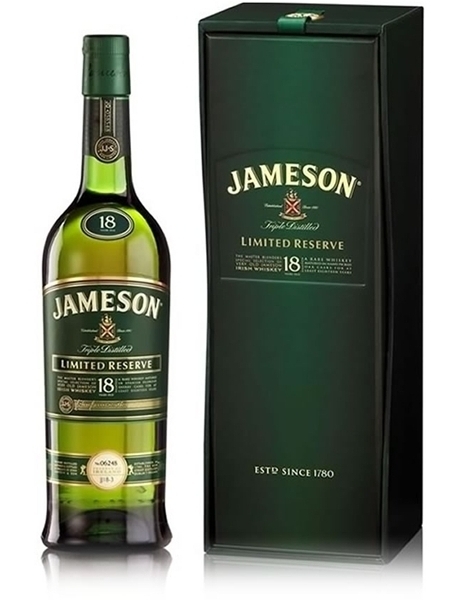 Since its debut in 2002, stocks of Jameson 18 Year Old Limited Reserve have been, as its name suggests, limited. So any opportunity to enjoy this connoisseurs' choice whiskey, in its individually numbered bottles, should be savoured.